Congrats on a great watch. Great photos too. Every time I see one I think thats the colour for me. Then a few scrolls down the thread I see the blue! Although I decided that the grey was my favourite when I looked at them in the AD. I really dont need another diver but I think the voices in my head are starting again. Im being strong so far. The SMP range is fantastic. I even like the 2 tone versions although theyre not for me. Oh I think I like that better than SMPw. Agreed in the DNA. The line is evolving, but every new model answers to that original. Kinda like the Porsche 911. BufordTJustice, Dohnut, Buschyfor3 and 6 others like this. Oh I love that wave dial! And in black! I really have to stop looking at pics of the new SMP.....thankfully, my nearest AD is a 45min Drive! BufordTJustice, AbsoluteMustard and georgegervin44 like this. Divers - Omega, Seiko, Ball, Sinn, Panerai, Muhle Glashutte, Tudor. The blurry one got the ambient light level about right. The properly focused pics appear far brighter than in person. Pics on an iPhone XR. 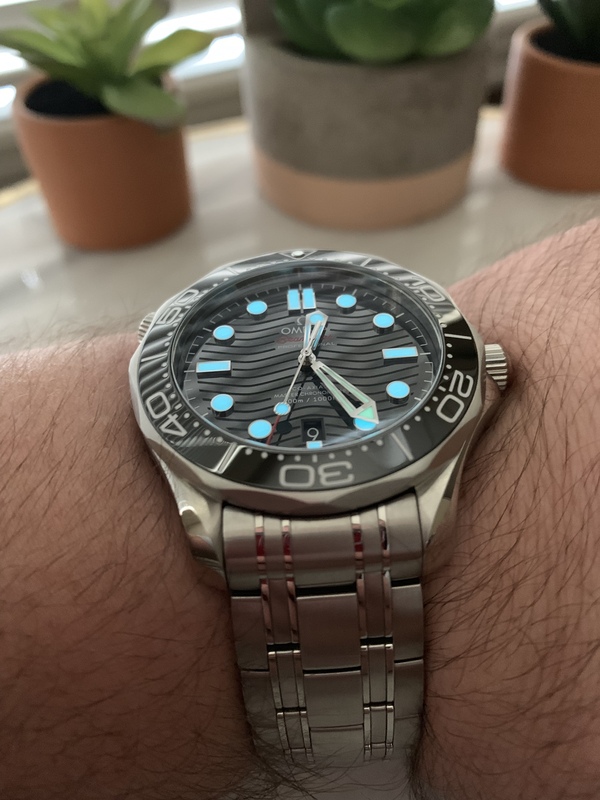 Almost as bright as my Seiko Kinetic Tuna (SUN045), which is the best lume I've ever seen on any watch to date. Irrespective of price. I'm very pleased. 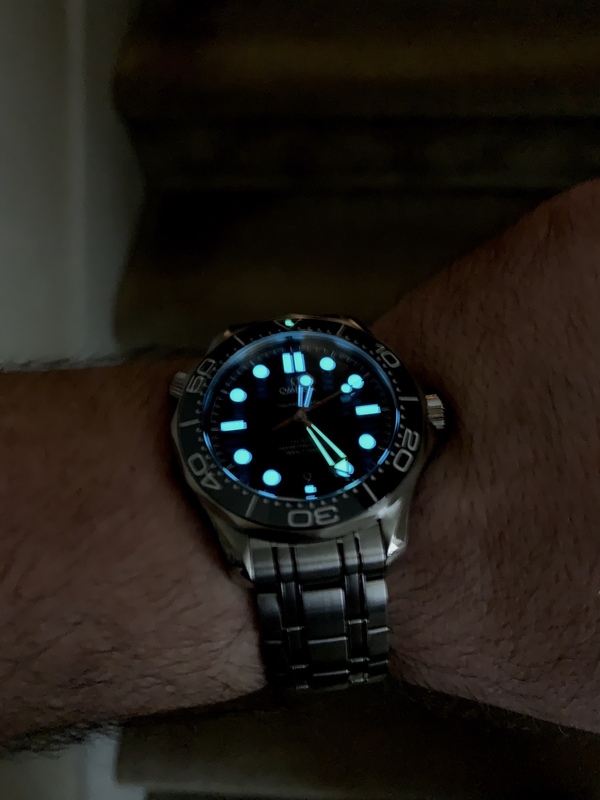 The differential lume on the minute hand makes quick time checks in a dark room REALLY easy and fast, especially at odd angles. Maddog1970, boatswain and P7ast1k like this. Since I got mine ( also black dial ) I haven’t worn anything else . Will also probably get hold of the rubber for summer. If you do, you won't regret it. I've worn nothing else since obtaining it. Not only have I been robbed of the desire to wear anything else, it's become a particular point of mood enhancement every morning when I put it on for the day. 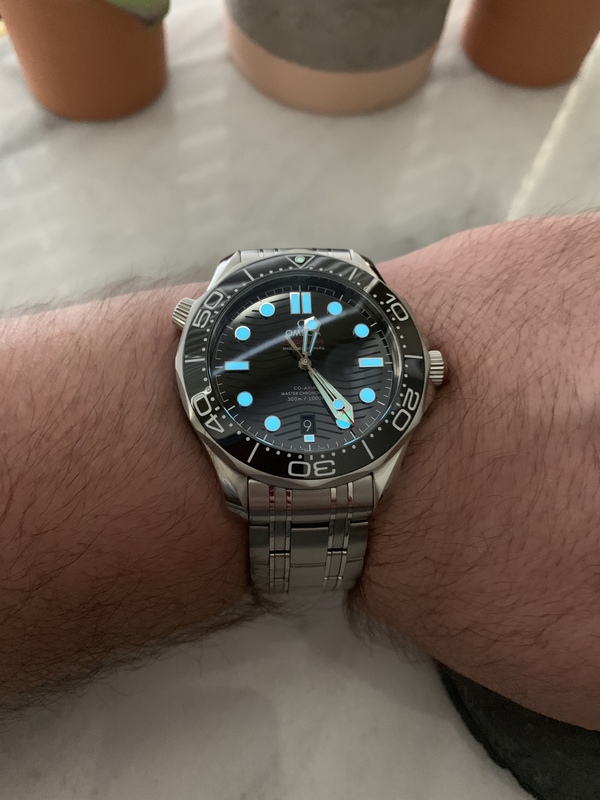 I am new to Omega, and feel the same way about my PO45......haven’t taken it off! But that black wave dial could give it a run for the money! Huge Congratulations on your new SMPw good looking watches there! great taste, great review too.